Having an infant on board means that we had to research and buy baby items that would work for us. The criteria were that it needed to be foldable so we could stowe it easily and it couldn't be metal so it wouldn't rust. I thought I would share with you some of our favorite items. 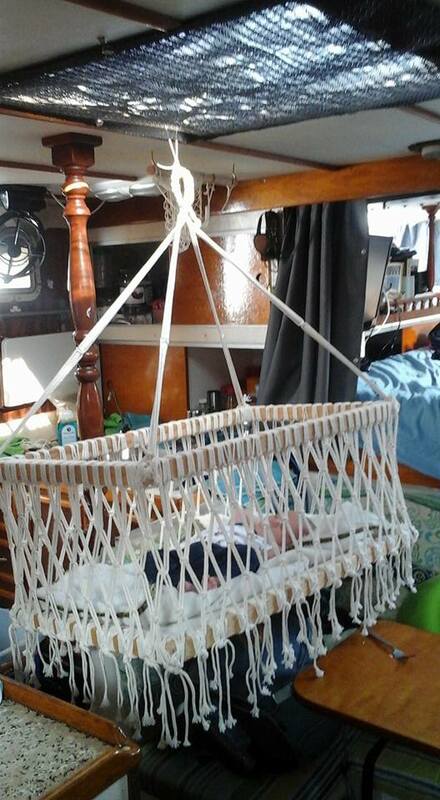 The bed that you can hang from the ceiling or outside from an halyard. We found it while in a little shop while exploring Barra De Navidad. It is handmade and seems very durable. A little on the heavy side but stores easy. The foldable pool. We found that treasure in a sport store in Belgium. 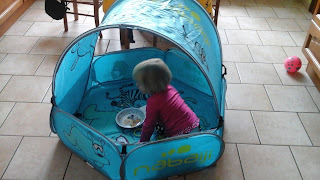 It folds as little as one of the sides, it's big enough for both kids to have room for a couple of years and it is not the cheap plastic that you usually find which pops after merely a couple of use. The adjustable top shade was definitely the deal breaker! The mode of transportation. We found the infant carseat very useful so far for car rides when we rent a car and to get to the pool so baby can sleep in the shade by the pool. 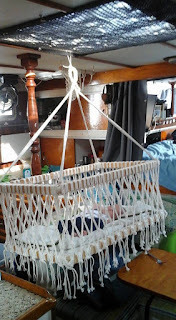 However it's very bulky, heavy and super hot for the baby to sleep in. The easiest is definitely a carrier. I'm a huge fan of carriers so I have a whole bunch of different ones. They are the easiest to use because they store very easily, are washable and most are not too hot to use in this hot weather. My big favorite is the girasol wrap. it's the comfiest. Nathan likes the Mei Tai better for its ease to use.